Needless to say, there is no Firewalking without a fire. 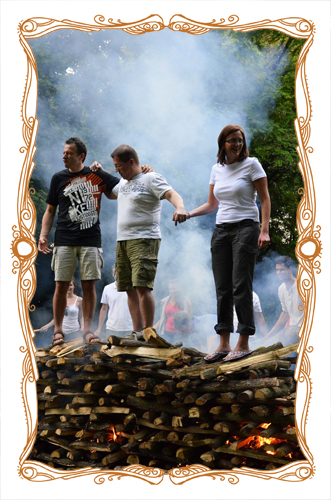 The preparation for Firewalking starts with the careful construction of a bonfire. The bonfire is not some campfire, but it is itself a work of art that will decisively influence the quality of ember, so - believe or not - the construction and "management" of the bonfire needs a serious expertise. A lot of factors influence the size, shape and nature of the bonfire depending on the number of participants, the facility of the location, the quantity, quality and type of wood available, as well as the weather conditions. Practically it is always decided on the spot and in the last minute as to how the pyre is built. Many people do not realize that it takes several days of careful preparation and planning to organize a Firewalking event! Not only is the place to be carefully assessed, but it is also important to ensure that all safety requirements and circumstances are met, as after the ignition the flames of the bonfire burn with incredible power and have their own "independent lives". 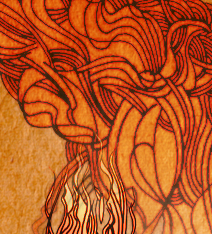 The pyre can only be "shepherded" and looked after, until its strength smolders quieting itself down and quenches. Therefore building a pyre requires considerable expertise and is a true art of engineering in its literal sense! It is a long road that leads from a pile of wood to a ready bonfire! Contrary to popular belief, not all types of soft wood is suitable for building a pyre because soft wood burns very quickly, and it leaves only a little live coal, rather ashen embers, which only burns with a temperature of 200-300 °C degrees smoldering in less than a half hour. We always strive to build a pyre that will provide enough ember to last at least 2-3 hours, so with the necessary raking we can keep the ember carpet alive and fresh. For larger groups (50-70 people) this time period is necessary so that all participants may take time to resolve. The bonfires built from hardwood (oak, beech, oak, acacia, etc.) burn at 1500 °C and are likely to be enhanced during combustion, resulting in coals burning at 600-700 °C on average, only losing heat slowly. We usually use about 1-1.5 m3 (or 1 pallets) of hardwood in a stack, which means ca. 800-1200 kg of timber depending on the quality and dryness of the wood. Since all kind of wood has quite different properties it is hard to judge how long it takes to produce the ideal amount of coal. Usually it takes about 2-3 hours to burn the bonfire. Building the pyre is not only a technical, but also an engineering task, where the primary aspect is maximum security and manageability. Our pyres are always designed to lean to the inside and slump into themselves. Our secondary goal is to make the slightest damage to the environment, so we try to reduce the size of the area burned depending on the type of pyre, based on the absolute need. The available size and character of the wood sets the necessary space and the size of the provided area. Firewalking can only be practiced on soil and solid ground, less on a grassy area, and therefore if it is not the case (e.g. if only areas covered with concrete are available), it should be covered with soil and lawn. Sometimes the grass layer can be protected by applying an extra layer of soil on top. 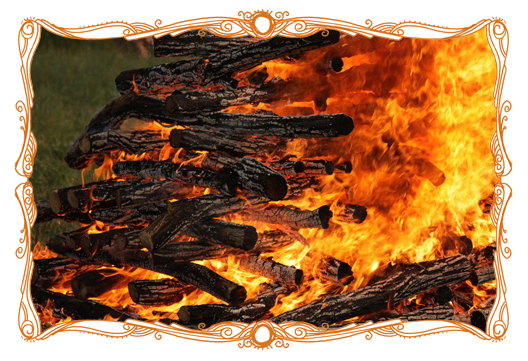 In addition to engineering tasks, the construction of the pyre, at the same time can be one of the elements helping the mental and spiritual preparation of the firewalk. For smaller groups there is always an opportunity to build the pyre together, which brings firewalkers closer to the fire, helping them processing their fears. In this case, it is possible to get rid of psychological stress and anxiety by placing the blocks of wood one by one. The lighting of the bonfire is always performed together, shared with some kind of ritual context that matches the modern age. In most cases participants have the opportunity to volunteer and enthusiastic applicants may wish to stand on top of the pile to face their own fears and test the actual boundaries of their own anxiety. With the ever growing flames burning at the stake, the importance of one's correct decisions is put in a clear focus, since one has to find the right moment, which is neither too early nor too late, to jump off the burning pyre. The ceremony of lighting the pyre is a kind of modern psychological ritual, which is a true inspiration to all participants. The group usually participates in the lighting of the pyre by drumming, singing or a joint "stick-dance". Naturally the "fire ignition ceremony" is not a mandatory element, - especially in cases of corporate firewalks - but according to our experience the "consecrating ritual" of the pyre is very much welcomed by all corporate groups. One of the ancient and universal rites of making contact with fire is circumventing the blazing bonfire or jumping above it. 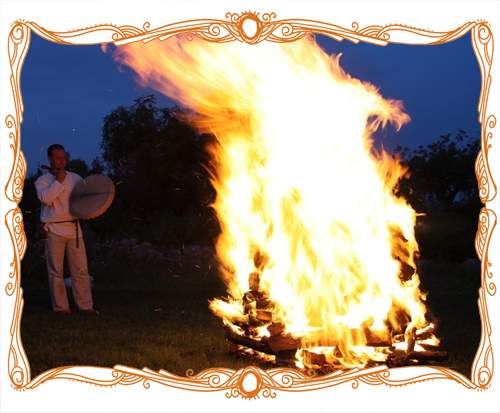 On Midsummer's Eve (21st June) fire-jumping is widely practiced throughout Europe and especially all over the country in Hungary. One of the most famous fire-jumping city in the south of Europe is Alicante in Spain, where local law states that: "That citizen who does not ignite a fire in the streets or does not shoot off any fireworks on Midsummer's Eve a punishment may be imposed on and may be fined between 20 to 100 Reals." Since 1932 and is a highly respected international jury selects the most beautiful bonfire. To honor this tradition and to pay our respect we also encircle the pyre and go around more than once to "dance around the bonfire". To do this, we teach a traditional dance or stick-dance ("botostánc") to the participants. Part of coming in contact with the fire is "wrestling with fire", which is an exercise that makes the inherent fire within us tangible and a clear first-hand experience. This is followed by a fire-jumping ceremony, which of course is not a mandatory part of the preparation. 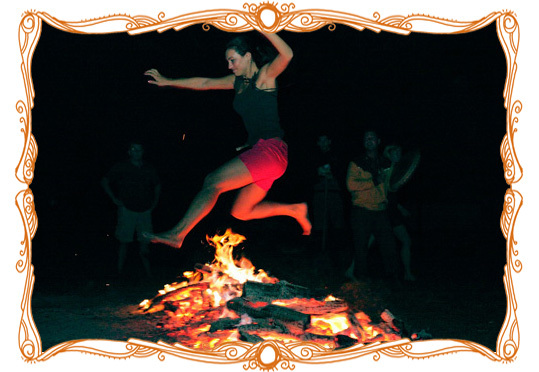 The way of fire-jumping varies from country to country: depending on local customs, the fire can be circumvented or most cases participants have to jump over it whenever possible. According to the tradition, whoever does the fire jump, his or her desires will be fulfilled. 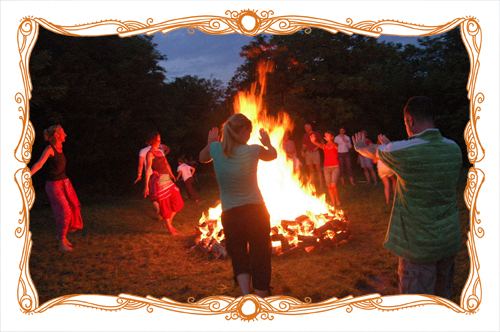 According to the Hungarian tradition, it is enough to skip the corners of the bonfire, but we usually encourage everyone to jump right across the fire. The more adventurous often jump the length of the stake! Above the considerations mentioned earlier, the construction method of the pyre is also influenced by what type of Firewalking event shall take place. 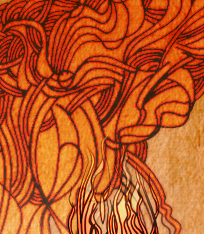 It is possible to walk or dance on the ember carpet but, above all, it is the ultimate goal of the fire walk and the participants' maturity and experience that determines what kind and how big a bonfire is made​​. Firewalking is not a selfish act. Its true meaning and purpose is to provide inspiration for all participants and to teach how to make correct and responsible decisions. Through its practice it increases the awareness of the true nature and hidden inner resources of the participants. Over the course of years, we were fortunate enough to try and improve a good number of bonfire types, starting from the short and long "funeral pyres" to the smaller and larger "chimney bonfires" straight to the 12-meter long "marathon" pyres as well as many smaller and shorter "refresher / multiplier" pile types. We are proud to say that we have tried almost every kind in snow and rain and wind and sunshine with 6 to 170 people. Thank you to all those who have tested themselves with us! We are proud to say, no one has been disappointed with us and our Firewalking program!